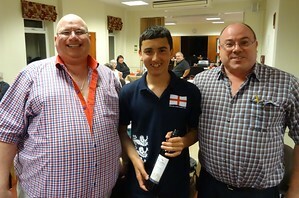 West Midlands BC last night hosted a fundraising event to support the junior teams participating in the World Youth Team Championships in China next month. Two sessions took place - a duplicate pairs, and a special Swiss Pairs competition. Fittingly the Swiss Pairs was won by Graham and Andy Cope - Andy is a member of the U16 team heading east in just a few weeks' time. They are pictured receiving prizes from event coordinator and Warwickshire Chairman, Darren Evetts - don't worry, Andy won't be enjoying his prize before playing in China (and probably not for another four years). The winners of the duplicate pairs were Joan Burke & Sonia Yagi. £1000 was raised through donations from members of Warwickshire CBA, West Midlands Bridge Club, and Coventry Bridge League. Many thanks to them all.